Fewer Farms = More Forest = Less Biodiversity? BOGOR, Indonesia (30 September, 2011)_If clearing tropical forests for agriculture is a major cause of the ongoing catastrophic decline in biodiversity, conventional thinking would have us believe that reducing the number of farms and allowing the forests to expand should help reverse that decline, at least locally. However, a recent article suggests that this assumption may not invariably be true. BOGOR, Indonesia (30 September, 2011)_If clearing tropical forests for agriculture is a major cause of the ongoing catastrophic decline in biodiversity, conventional thinking would have us believe that reducing the number of farms and allowing the forests to expand should help reverse that decline, at least locally. However, a recent article by researchers James P. Robson and Fikret Berkes of the University of Manitoba suggests that this assumption may not invariably be true. Their paper, published in the journal Global Environmental Change, is based on field research in Mexico’s Oaxaca State, a region of both exceptionally high biological and cultural diversity. The two indigenous communities they studied in depth are losing farms and gaining forests as residents leave their fields and orchards to move to cities or seek off-farm sources of income. But, the authors argue, the community territories may actually be getting less biologically diverse as well. The key to this apparent paradox lies in the kind of resource management that was traditionally practiced in the region and is now being lost. 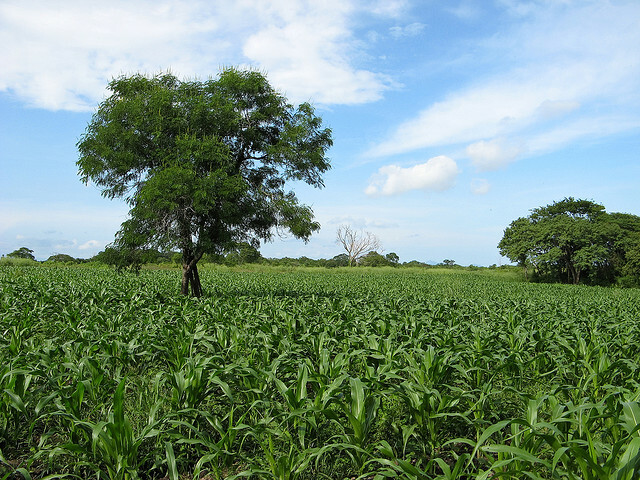 Agriculture in the Oaxacan highlands, Robson and Berkes contend, was highly dispersed, rotational and yet low-intensity; fields were small and temporary, crop diversity high and farming was interrelated with natural ecosystems in multiple ways. These patterns resulted in “pronounced spatial heterogeneity in forest structure and composition, and created a high biodiversity forest–agriculture mosaic”. Interviews the researchers conducted with village residents suggested that those practices are now rapidly changing. As much as 60% of agricultural lands in the two communities have been abandoned over the past 30–40 years, reflecting a similar fall in the number of village residents. What fields are still farmed tend to now be clustered around settlements, spread through a very few altitudinal zones, and simpler in their crop make-up and structure. Non-agricultural use of local resources is likewise fading. Far less collecting of both wood and non-wood products goes on in local forests, reflecting an aging village population that is less apt to engage in strenuous activities, as well as an emerging preference for modern, store-bought goods. Understanding the complexity and the consequences of the intertwined changes occurring in Oaxaca—demographic, ecological, cultural and economic—calls for a sustained longitudinal research effort. While they marshal considerable qualitative and quantitative data, using both their own field results and quantitative studies done in other areas of southern Mexico, Robson and Berkes insist that far more work is urgently needed. Their research to date does not allow them to do much more than “speculate” on the effects of agricultural abandonment on local biodiversity, although they speculate in a highly informed way. The mix of qualitative and quantitative evidence they put together suggests that “the decline of land use activity may result in a gradual loss of the forest–agriculture mosaic, leading to localised declines in biodiversity, despite (or because of) extensive forest resurgence”. Such declines, at first glance counterintuitive, the authors suggest, may be attributed to a number of observable changes that agricultural abandonment has produced, including “unprecedented changes in ecological succession, patch size, and edge effects” as well as declines in agroforestry systems. Before filing away these provocative ideas as paradoxical changes occurring in a few remote villages, it is important to note that neither the low-intensity resource use traditionally practiced in the study’s communities, nor most of the processes that are now transforming those patterns, are confined to highland Oaxaca. Rapid urbanisation, simplified agricultural systems and abandonment of local resource use traditions are sweeping across the forested tropics. This paper therefore offers lessons for policymakers far beyond Mexico’s borders. Those who make both conservation and agricultural policy have long tended to assume that agriculture is the enemy of conservation (and vice versa). Indeed it seems obvious that whatever eliminates agriculture and encourages forest resurgence must simply be good for biodiversity conservation. As this example points out, the obvious may prove to be inaccurate. Long-standing interactions between forests and the forest people who manage them are anything but simple and are still little understood or appreciated. When those interactions are eliminated, we should expect that forests will change in unanticipated and perhaps unwanted ways. Investigating and promoting low-intensity management, on the other hand, may yield surprising biodiversity benefits. Robson, J.P. and F. Berkes. 2011. Exploring some of the myths of land use change: Can rural to urban migration drive declines in biodiversity? Global Environmental Change 21:844–854. Soybeans and forests in Brazil’s Arc of Deforestation: A temporary truce?